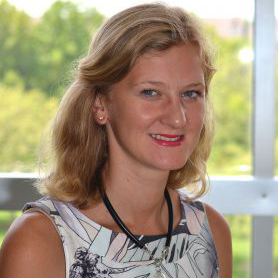 Dr. Olena Mazurenko is an Assistant Professor in the Department of Health Policy and Management. She holds a PhD in Health Care Administration from the University of Alabama at Birmingham, a medical degree in the specialty of Internal Medicine from Ukraine, and completed her Master’s degree in International Health in Germany. Before joining IU, Mazurenko was an Assistant Professor of Health Care Administration and Policy at the University of Nevada, Las Vegas. Dr. Mazurenko’s research examines patient experiences in various healthcare settings, such as patient-centered medical homes or hospitals. Additionally, her research analyzes the population of clinical professionals, including international medical graduates and foreign educated nurses, who received their training overseas but currently practice in the United States. Dr. Mazurenko has taught courses in human resource management, global health, strategic management and introduction to health care system at the undergraduate and graduate levels. The relationship between integrated service delivery and quality and cost outcomes for mental health. Family and Social Services Administration of Indiana (Total Funding: $514,193.00). Role: Co-Investigator. Designing User-Centered Decision Support Tools for Chronic Pain in Primary Care. Agency For Healthcare Research and Quality (AHRQ) (Total Funding: $1,954,230). Role: Co-Investigator. Examination of determinants of job satisfaction and retention among Philippine nurses: the role of the workplace integration practices. Funded by CTSI IU. Mazurenko, O., Richter, J., Kazley, A., Ford, E. (2016). “Examination of the relationship between management and clinician agreement on communication openness, teamwork and patient satisfaction”. Journal of Hospital Administration 5 (4), 20-27. Mazurenko, O., Hearld, L. & Menachemi, N. (2015). “The Relationship between External Environment and Physician' E-mail Communication: The Mediating Role of Health Information Technology (HIT) Availability”. Health Care Management Review. Mazurenko, O., Bock, S., Prato, C., Bondarenko, M. (2015). “Considering shared power and responsibility: Diabetic patients’ experience with the PCMH care model”. Patient Experience Journal, 2(1), 61-67. Mazurenko, O., Zemke, D., Lefforge, N., Shoemaker, S., Menachemi, N. (2015) “Determinants of patient’ post-surgical experience: comparison of patients’ and clinical staff voices”. Journal of Healthcare Management, 60 (5), 332-347. Mazurenko, O., Hearld, L. (2015) “Environmental factors associated with physician’ engagement in communication activities”. Health Care Management Review, 40 (1), 79-89. Mazurenko, O., Hulchiy, O., Qu, H., Hernandez, S.R., Shewchuk, R. (2012) “Determinants of Physicians’ Career Choices in Ukraine”, International Journal of Behavioural and Healthcare Research, 3 (3/4), 291-305. Mazurenko, O., Menachemi, N. (2012) “Environmental Market Factors Associated with Physician Career Satisfaction”. Journal of Healthcare Management, 57 (5), 307-324. Menachemi, N., Mazurenko, O., Kazley, A., Diana, M., Ford, E. (2012) “Market Factors and EMR Adoption in Medical Practices”. Health Care Management Review, 37 (1), 14-22. Mazurenko, O., Yeager, V., Gupte, G. (2012) “International Medical Graduates and Health Information Technology Use in the United States”. Advances in Health Care Management, 12, 121-143.